Two days after NASA launched a test model of its Ares 1 rocket, the flight's mission manager confirmed the first stage descended to the Atlantic Ocean on just one fully functioning parachute, damaging the booster as it splashed into the Atlantic Ocean harder than expected. All three main parachutes initially unfurled to a partially deployed, or reefing, position as planned. But one chute subsequently deflated and another developed difficulty going to a fully deployed position. The $445 million Ares 1-X test flight launched Wednesday to provide data on the Ares 1 rocket NASA is building to carry future astronaut crews into space. The launch went smoothly throughout the two-minute burn of the first stage, an unmodified space shuttle solid rocket booster. Engineers added an inert fifth segment to the first stage, a dummy aerodynamic clone of the upper stage, and a simulator of the Orion crew module and launch abort system. The upper half of the 327-foot-tall rocket was not designed to be recovered, but NASA stuffed parachutes into the first stage to allow the rocket to be retrieved just like a shuttle booster. The Ares 1-X parachutes are the same design that would eventually be used to recover Ares 1 first stages, but the first stage in Wednesday's launch was 15 percent heavier than future operational boosters. The extra weight comes from ballast and avionics in the simulated fifth segment. "This was an overtest of the Ares 1 chutes," said Bob Ess, Ares 1-X mission manager. Two stabilizing pilot and drogue parachutes deployed as planned, but the three main parachutes did not work correctly. The main chutes are made of kevlar and are each 150 feet in diameter, slightly larger than the parachutes for the shuttle boosters. Wednesday was the first time the Ares 1 parachutes had been tested at such high altitudes and pressures. Drop tests from airplanes can only deploy at lower altitudes or just one parachute at a time. "All three came out as expected in basically a 50 percent opening condition. So all the chutes were good. A couple of seconds after all three were in this 50 percent opening position, one of them failed. We saw the lines go slack and it basically became a streamer," Ess said. A second parachute suffered some damage as the three chutes disreefed, or completely unfurled, a few seconds later. 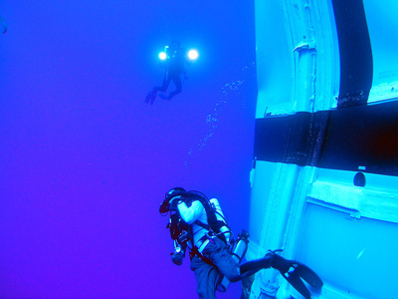 "As we went to disreef into the fully open position, a second chute appeared to have some damage. It was still pretty much intact, but part of it seemed like some of the riser lines or suspension lines seemed to get fouled or cut, so part of the parachute was not inflated," Ess said Friday. "We had one good one, one completely failed one, and then one was probably about halfway," Ess said. According to NASA, the parachute deployment sequence was captured on video by a nearby chase plane, but the imagery will not be released until next week. Descending on about one-half of the expected deceleration from the parachutes, the first stage booster splashed down in the Atlantic Ocean at a higher speed than designed. The partial deflation of one of the chutes likely caused the empty booster to hit the water with some horizontal movement, making the impact worse. "What that caused is a hard impact and the vehicle slapped down," Ess said. The dented first stage booster casing. Divers from the Freedom Star booster recovery ship were sent in the water to ready the rocket for towing back to Cape Canaveral. They observed a large dent on the external casing of the booster. "The aft-center segment has this dent in it, which appears to be more of an impact buckling load affect," Ess said. Inspections also showed a joint between the rocket's upper segment and an inert fifth segment was jarred open by the impact. There was also damage to actuators inside the first stage steering system. "The damage was just all collateral because of the parachutes," Ess said. "We're not going to dwell on the damage. We weren't planning on using this booster again." The booster was towed back to Cape Canaveral this morning, arriving at Hangar AF on the Air Force side of the spaceport for further inspections and disassembly. "We're not worried about it. There's no investigation, there's no unusual thing we're doing," Ess said. Ess said it would be next week before engineers can look at the parachutes and begin looking for the cause of the failures. "It appears that the suspension lines themselves may have failed, as opposed to the parachute material. Again, we'll have to look at it in person to verify that, but that's what the video seems to imply," Ess said. Despite engineers' focus on the Ares 1-X parachutes, the rest of the flight went off without a hitch, based on the first look at data from the mission. "Rock solid is the word that we used," Ess said. "It sounds boring, but it was exactly like the simulation said it should be. In fact, our simulation showed a whole lot worse when we put in dispersions." 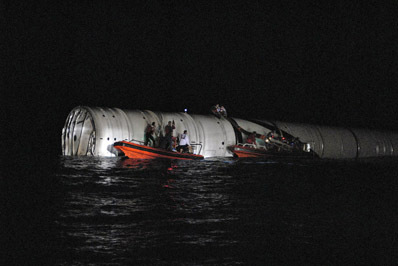 Divers work to recover spent Ares 1-X booster. Workers found more damage at launch pad 39B than after a typical shuttle launch, including two toxic propellant leaks that caused evacuations from the complex. The lion's share of the damage is on the lower portion of the pad structure, where the rocket's glowing hot plume was directed during liftoff. Because of the direction of the plume, engineers expected more damage than usual after Ares 1-X. The rocket's control system worked as designed, expertly flying the slender launcher through the most dense layers of the atmosphere as pressures on the vehicle reached up to 900 pounds per square foot. Those pressures were slightly higher than predicted, but well within the rocket's design envelope, according to engineers. The performance of the control algorithms gave Ess "great confidence that they found a way to handle all the winds in this long, skinny vehicle." The booster's roll control system also functioned perfectly, spinning the rocket 90 degrees a few seconds after liftoff and keeping the vehicle stable throughout the flight. Initial concern over the rocket's reaction after stage separation has also been muted after further analysis. The uncontrolled upper stage simulator went into a flat spin moments after separation, seemingly barely missing contacting the first stage. 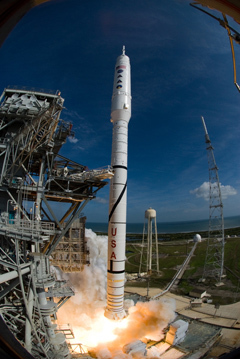 "We did not see any recontact between the upper stage and the first stage. If you look at one view, it's tough to get any depth perception there, but we looked at multiple views," Ess said. It turns out engineering simulations actually predicted such an occurrence. "We went back and looked at all the flight models and dispersion cases that we ran, and we found thousands of them that matched what we saw," Ess said. Ess described the upper stage simulator as "inherently unstable" because its center-of-gravity is located near the back end of the vehicle. During real Ares 1 launches, the upper stage engine and thruster system would keep the rocket under control. When asked to rate the success of Wednesday's launch on a scale of 1 to 10, Ess did not hesitate. "Ten without a doubt. That fact the (parachutes) didn't work is not a problem. We want to find these things that aren't quite working the way we (thought)."